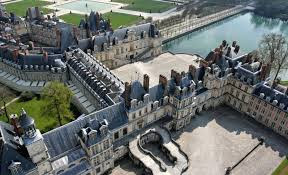 How can a Medieval Hunting Lodge for French Kings be transformed into a stunning Palace that spawned Renaissance Art in France? To answer this question we need to delve into the fascinating history of the Palace of Fountainbleau (in French: Château de Fontainebleau). The long history of Fontainebleau stretches back almost a millennia. In 1167 a fortified castle was built at Fontainebleau, about 50 km from Paris. Termed a castle, it seemed to be more of a glorified hunting lodge for the Kings of France to show off their prowess against the abundant game in the area. Then, when done hunting, they could luxuriate in one of the many springs scattered throughout the surrounding forest. Indeed, the name of the later Palace was derived from one of these springs, the fountain de Bliaud. Over the course of the next three centuries more than one King Louis cavorted behind the castle's stout walls. King Louis VII invited Thomas Beckett to the castle and had him consecrate the chapel in 1169. And Louis IX had a hospital and a convent built next to the castle. To witness the beginning of the large scale changes to the castle we need to skip forward to the 15th century to the reign of King Charles VI (1380-1422). It was actually Charles' wife Isabeau of Bavaria who began to shake the place up a bit with some modifications to the castle. Isabeau had definitively set the stage but it wasn't until 1515 when Francis I took the throne that the renovations truly got off to a start. Francis commissioned French architect, Gilles le Breton, to build him a grand palace in the new Renaissance style, a palace henceforth known as the Palace of Fountainbleau, Instead of demolishing everything, Giles le Breton built around portions of the original castle, incorporating them into the new palace. His architectural prowess can be seen in such areas of the Palace as the monumental Renaissance stairway, known as the portique de Serlio. But perhaps the most significant period of the Palace's history, and indeed the history of art in France, was yet to come. Francis I had a grand gallery (long hallway) built, linking his apartments with the Palace's chapel. He wanted it elaborately decorated. To achieve this goal he hired Italian architect, Sebastiano Serlio, and Florentine painter, Giovanni Battista di Jacopo, better known as Rosso Fiorentino. For the next six years they worked tirelessly, adorning the gallery with sumptuous murals and stucco reliefs, all glorifying the King. A third painter, the Italian, Francesco Primaticcio, came over to add his own artistic flair. Together this team created a style now known as the first 'School of Fountainbleau'. This can be considered the beginning of Renaissance Art in France. Over time more French kings added their own touches to the amazing Palace of Fountainbleau, either to the current structure or acquiring more surrounding lands to build more wings. To detail all of the building works would take me all day! Click HERE for a more detailed discussion on the Palace of Fountainbleau. Having said that, there were two later additions that I found interesting. The Theatre, built during the reign of Louis XV. And the Chinese Museum, added in 1867. On 22 January 1951, France issued another set in their Sites and Monuments series. This series comprised six stamps. 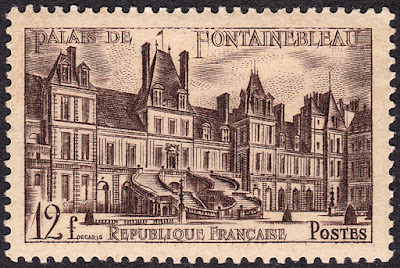 The 12f Palace of Fountainbleau stamp was designed and engraved by Albert Decaris. 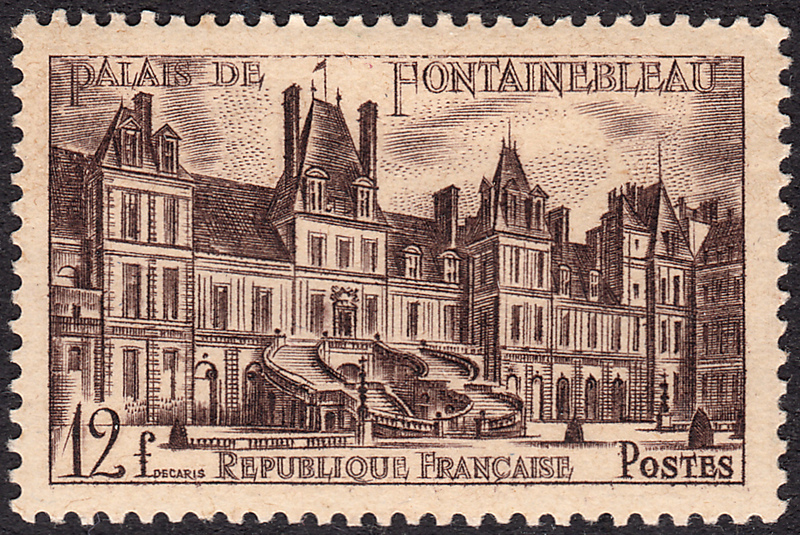 This gorgeous stamp features the East Wing of the Palace. Decaris has managed to capture the true essence of this incredible example of Renaissance architecture. The steep-pitched roofs. The elegant dormers. The tall, slender chimneys. It's all here. Decaris has even chosen a font for the titles that reflects the Renaissance era. 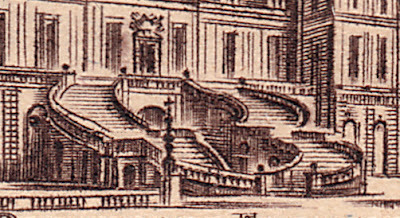 But perhaps the most important aspect of this stamp design is the famous Horseshoe Staircase, dominating the foreground. This striking architectural feature was originally constructed during the reign of King Henry II. Henry and his wife, Catherine de' Medici, extended the East Wing of the Palace and added this staircase to serve as a grand entrance. In 1640 the staircase was rebuilt for Louis XIII into what we can see today. The image below gives one the sense of the scale of this massive staircase. Sorry about that, Nivelle. And thanks for the kind words.